Mitsubishi has never been considered as a mainstream manufacturer, trading instead on its specialism of four-wheel drive performance cars and rugged off-road models. What is less well known is its expertise in electric drivetrains, but it was one of the first major manufacturers to launch a modern electric car with the i-MiEV back in 2010. Mitsubishi has distilled all of this knowledge into the second generation of the Outlander. This time around you get a bigger petrol engine which now displaces 2.4 litres combined with two slightly tweaked electric motors which power the front and rear axles. The result is more performance combined with better fuel and electricity consumption. Which is nice. Unusually for a hybrid you can also tow up to 1500kg. Once fully recharged you can drive for up to 33 miles in full electric mode and once the battery runs out the Outlander continues to operate as a hybrid, blending electric and petrol drive as required. 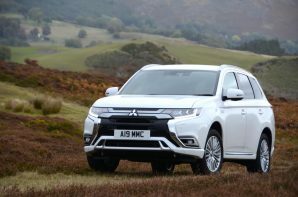 Mitsubishi is very open about the fact that the official fuel consumption is overly optimistic stating that in petrol mode 49 mpg is more realistic. The company also helpfully points out that after 106 miles fuel economy drops below that of the diesel model. The best bits about the system are the useful electric range, the ability to adjust the level of regenerative braking with wheel-mounted paddles, and the improved performance including an increase in the electric top speed from (an illegal) 78 mph to (an even more illegal) 84 mph. Yes the styling isn’t particularly adventurous and the interior isn’t as sharp as it should be, but if you regularly cover less than 30 miles between charges, it offers big savings in running costs and tax and is competitively priced too. Recharge time: 240v charge 5 hours, 3.6 kW home wallbox (free option) 3.5 hours, rapid charge 25 minutes from 0 – 80%.